Farinon UHF Salvage - What is it? Have you every heard of Farinon radios? Here are some pictures of a Farinon UHF radio rack. Is anything in this rack useful to an amateur radio operator? If not, it looks like there is some gold in them there radios. Who knows what we'll find inside that dual power supply! Who knows what we'll find inside this dual power supply. Notice the dual power cords! Looks like there is some gold in them there radios. If you recognize any of these devices please leave a comment. This post is the first in a series covering a salvaged Canadian Marconi VHF Repeater system. The system includes DK66 Transmitter - Receiver, QJ66 Repeater and WJ10 Power Supply. Sometimes radios, even entire radio stations, are discarded and sent to the land fill without a second thought. A second thought of repurpose, reuse or recycle. 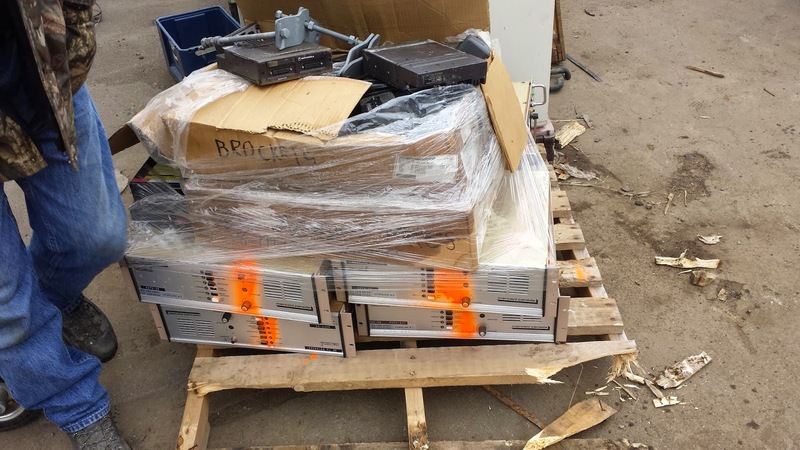 To help find and save condemned radio equipment. To catalog collections of saved radio gear. To find someone who can put used radios components to good use. To promote radio recycling and give used radio equipment a opportunity to continue a useful and productive existence. Amateur radio operators often adopt condemned radio equipment. They adopt it and find ways to extended its useful life.